Newcastle XI: Elliot, Janmaat, Mbemba, Coloccini, Dummett, Colback, Shelvey, Sissoko, Wijnaldum, Perez, Mitrovic. West Ham XI: Adrian, Tomkins, Collins, Ogbonna, Cresswell, Noble, Kouyate, Obiang, Payet, Valencia, Antonio. Phew, That was nail-biting. Newcastle hold on for their first win in six league games, while West Ham suffer a blow to their hopes of mounting a challenge for a top four spot. Newcastle centre-back Fabricio Coloccini leads a counter-attack, with striker Aleksandar Mitrovic having a shot saved by Adrian before Jonjo Shelvey puts a long range effort high. Jack Colback sends a low long range shot just wide for Newcastle. There'll be six minutes of added time. Yes, Newcastle fans, six more minutes of torture. Very rarely do you see a striker have the most touches of the ball for his team. Normally a midfielder or defender get the honour but this is Aleksandar Mitrovic today. The striker has had 61 touches - that's more than Jonjo Shelvey in midfield (59). Some graft on show for sure. Newcastle keeper Rob Elliot makes a vital save. Nikica Jelavic crosses for Cheikhou Kouyate and his downward header from close range is kept out by the knee of Elliot. West Ham aren't really creating any chances but there's still plenty of anxiety around St James' Park. Slow as you like. Ayoze Perez trudges off as Yoan Gouffran comes on for Newcastle. Jonjo Shelvey takes matters into his own hands as he has a pop from 30 yards. Keeper Adrian parries the strike before gathering at the second attempt. Newcastle boss Steve McClaren is up out of his seat in frustration as another chance goes begging for his side. Aleksandar Mitrovic cuts inside a defender and goes for precision rather than power and has another shot saved by Adrian. West Ham winger Victor Moses comes on for Michail Antonio. Newcastle seem to have found their form from the first half. A Jonjo Shelvey shot is blocked before Aleksandar Mitrovic has a shot tipped over by Hammers keeper Adrian. Aleksandar Mitrovic has a chance as he meets a Daryl Janmaat cross but the Magpies striker fails to get enough power on to his near post effort as keeper Adrian saves. Will Newcastle pay for their missed chances? "West Ham have got the early goal in the second half. Newcastle should have been out of sight at the break, but we know their confidence has not been great this season and it will be a test for them to see this out." Newcastle boss Steve McClaren takes off left-back Paul Dummett and brings on new midfield signing Henri Saivet. Cheikhou Kouyate is back on the pitch for the Hammers as well. Cheikhou Kouyate looks to have fallen awkwardly and goes off for treatment. Nikica Jelavic gets his first West Ham goal in the Premier League with his second touch of the day. He took one touch to round the keeper and one more to net. Now that, ladies and gents, is what you call a substitution. Just what the Hammers wanted. 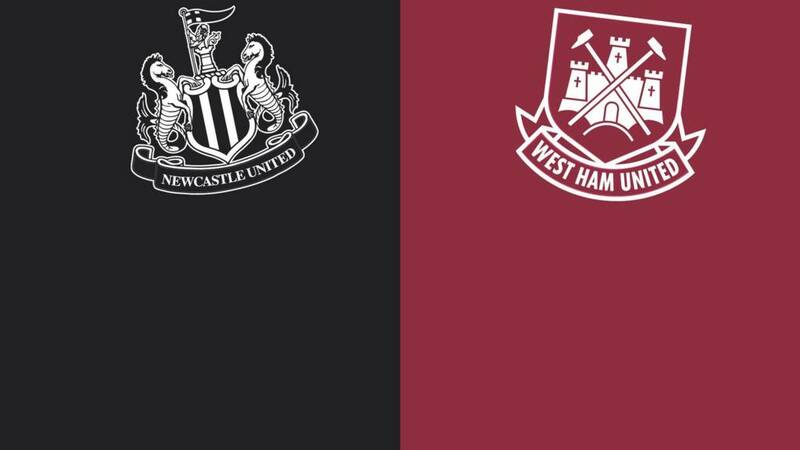 Georginio Wijnaldum misses a glorious chance for Newcastle and West Ham go up the other end and score. Magpies defender Chancel Mbemba, under pressure from Enner Valencia, produces a stray backpass which Nikica Jelavic intercepts and rounds keeper Rob Elliot before slotting home.